While modern portable systems pack a nice punch and feature high-end graphics solutions sometimes it’s just not enough, as Apple users know only too well. That’s where external graphics cards come into play and for all the creatives out there something exciting is happening – Sonnet has announced the release of their eGFX Breakaway Box! The eGFX Breakaway Box supports any Thunderbolt compatible PCIe card, with 40 Gbps of bandwidth and a full PCIe 3.0 x16 slot, there’s plenty of power to share giving you the flexibility to add whatever you want to boost your capability without any degradation of speed – which was an issue for the previous Sonnet box. The Sonnet eGFX bundled with the AMD Radeon RX 580 is VR ready for new OSX High Sierra. This is the recommended spec as per the Developer Kit for AR/VR at this summers WWDC. Though Apple didn’t mention the word Sonnet by name at WWDC it was apparent from their images that this was the chosen solution. Cost is £5.50 per week when added onto your lease for a new Mac from HardSoft. Everyone who loves Apple knows that being unable to increase your capacity can be frustrating, and in the past any attempt to add to it externally has often come at the cost of the speed of your device. But with the arrival of the latest eGFX Breakaway box you can now be free from the constraints of your in-built system and go crazy with your creativity, especially as everyone moves towards VR (Virtual Reality), or AR (Augmented Reality) as our friends at Apple like to call it. The Breakaway Box supports every other Thunderbolt-compatible PCIe card, regardless of the card’s length or width—its single x16 PCIe 3.0 slot easily accommodates full-length cards such as the RED Rocket-X or AVID Pro Tools|HDX. The Breakaway box connects through a single 40 Gbps Thunderbolt 3 Type-C port and whilst using a single port removes the daisy-chained setup options, it does offer the connected graphics card it’s full bandwidth. Delivering the full PCIe 3.0 x16 speeds with 2750MB/s available bandwidth. it allows you to take full advantage of the external graphics cards. 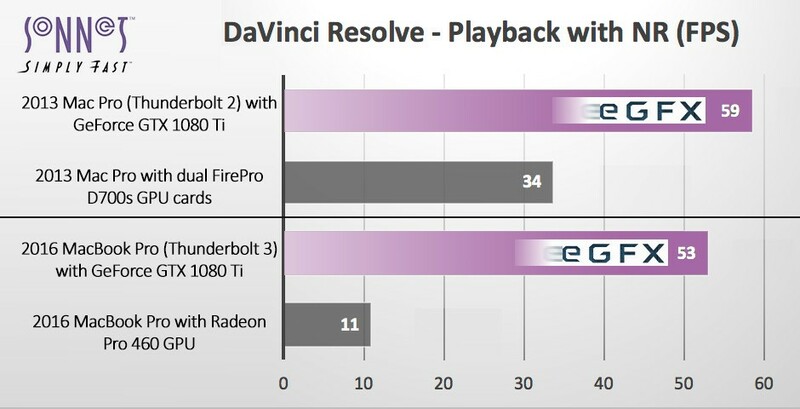 It is in fact over double the performance of a Thunderbolt 2 generation. Sonnet eGFX Breakaway Box -350watt- with AMD Radeon RX 580- 8GB (Part of Apple Developers kit for VR) at £5.50 per week on a three year business lease and €6.40 to EU/Irish customers. You can lease the Sonnet eGFX 350 with the Geforce GTX 1080TI at £9.70 per week plus VAT on a bundle offer with a three year Flexi Lease. The Geforce GTX 1080ti features 11GB of GDDR5 ram and has a blistering CPU speed of 1582GHz. It has three mini display ports and we can offer adapters for your screens. The ‘350’ version means the card can be no more powerful than 350 watts. Other Sonnet peripherals for the Mac are available to lease and prices are based on a three year lease and includes three years warranty . If you need an even better Graphics card for your Mac then we can offer alternatives but we would need to match your choice of card and may need the 550 watt version on the eGFX box. This offers 550 watts of power to the graphics card. This box is more expensive than the 350watt version. The eGFX Breakaway Box 350 has 8-pin plus one 6-pin auxiliary power connector and supports graphics card needing 300 W or less. It provides 15W of upstream power. The eGFX Breakaway Box 550 has DUAL 8 pin power connectors supporting up to 375W of juice, and provides 87 Watts of power upstream. It could actually charge your MacBook. So who is excited about this new arrival and the possibilities it opens up? We certainly are! If you’d like to find out more about the eGFX Breakaway Box and how it can help improve your life, get in touch with our great sales team on sales@hardsoft.co.uk or call 020 7111 1643. HardSoft offer flexible leasing of high end Mac systems to creative users and are Apple Authorise. The Sonnet eGFX fits perfectly into our portfolio and yet again the high pricing of Apple based products means leasing becomes the obvious choice to lease these. Physical setup was fairly simple but there are some scripts and terminal commands required via the online manual (not listed in the boxed manual) and do require a number of restarts + upgrading the Mac to the latest version of MacOS Sierra.Initially there was some distortion on the screen but it seems to have disappeared after altering the display settings as per the manual and rebooting. Have run a couple of YouTube videos on multiple screens for a couple of hours and there does not seem to be any issues.